"This book offers a bold new concept, the "nature state," intended to take its place beside useful terms such as the welfare state or patrimonial state. Building on fresh case studies from every inhabited continent, the volume explores the tangled links between states and the natural world in illuminating ways." "Environmental history takes an important and imaginative stride forward with the concept of a ‘’nature state’’ introduced here through a rich collection of unusual and varied examples. 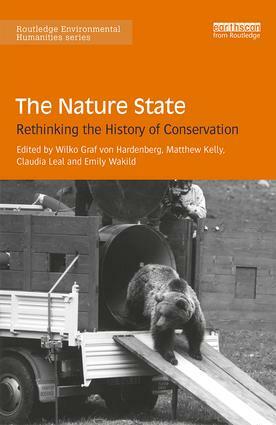 This innovative approach to theorizing state control over the natural environment in the 20thcentury will serve as a productive model for future scholarship on this exciting theme." "[T]he contents of The Nature State are wide-ranging in topic and diverse in space. A quick list will illustrate the case studies from every inhabited continent: national parks in the Philippines, Namibia, southern India, Colombia and Brazil, science and conservation in Patagonia, China’s tropical rainforests and in the Danube Delta. A rich haul indeed, all well written, balanced and interesting…The book will be useful as a teaching tool and, no doubt, the type of discussion at the ESEH panel will be replicated in the classroom and beyond." 6. Conventional thinking and the fragile birth of the Nature State in post-war Britain. Wilko Graf von Hardenberg is a Senior Research Scholar at the Max Planck Institute for the History of Science in Berlin, Germany, where he coordinates the working group ‘Art of Judgement’. He holds a PhD in geography from the University of Cambridge, UK, and has worked at the University of Wisconsin-Madison, USA, the Rachel Carson Center, Munich, Germany, and the University of Trento, Italy. Matthew Kelly teaches history at Northumbria University, UK, where he is helping to establish the environmental humanities as a broad area of research and teaching within the university. He was an Associate Professor at the University of Southampton, UK, and a Fellow of the Rachel Carson Center, Munich, Germany. Claudia Leal holds a PhD in geography from the University of California at Berkeley, USA, and is Associate Professor in the Department of History at Universidad de los Andes in Bogotá, Colombia. She was a Fellow of the Rachel Carson Center, Munich, Germany, and Co-president of the Latin American and Caribbean Society for Environmental History. Emily Wakild teaches Latin American and Environmental History at Boise State University in Idaho, USA. Her current projects include a primer on teaching environmental history and a monograph on the social and ecological regions of Amazonia and Patagonia.